Let us consider the two situations. Eoin Morgan thinks he edged the ball from Praveen Kumar during the first innings at Lord’s and walks off even before the umpire had made a decision. Rahul Dravid stood his ground as the umpire shook his head declining England’s appeal for a bat-pad decision. In both circumstances, the video evidence shown on the television for all the viewers to see, with the tools that are considered to be part of the Decision Review System (DRS) – HotSpot and the audio feed from the stumps – do not know show overwhelming evidence of batsmen putting bat to ball. This is in a series where Stuart Broad checked VVS Laxman’s bat for the non-existent Vaseline. Before you go any further and think I am a technophobe and have an anti-DRS stance, let me assure you, I am neither. In fact, use of technology is good. I don’t tow the line of Sunil Gavaskar and Ravi Shastri and say that technology needs to be foolproof before it can be used to review an umpire’s decision. As someone that has been trained to work with technology all my life, I do understand technology cannot be foolproof at all times. However, in modern day sports, technology has a role to play. Even though its efficiency may be limited by several issues, – for example, amount of light in the case of HotSpot – its implementation by the third umpire needs to be consistent. According to the pre-series agreement between the BCCI and ECB, the DRS instituted consisted of the HotSpot and the audio feed from the stump microphone. There is a clear distinction between the DRS and the replays that the on-field umpires call for when they are not sure, such as run-outs, stumpings and bump balls. Based on the evidence that was shown on television, both Eoin Morgan and Rahul Dravid were not out. In the former’s case, the decision never went to the third umpire as Morgan walked off the field on his own volition and in the latter’s case, the third umpire Steve Davis was called in to review whether the decision taken by on-field umpire Rod Tucker was the correct one. A few over earlier, when Rod Tucker adjudicated Rahul Dravid to be out (caught at short leg, off bat-pad), Dravid went for a review right away. The replays showed the ball missed the bat by the proverbial mile, but more importantly, HotSpot did not pick any indication of an edge. Thus, within the constraints of the mutually agreed upon DRS, the on-field decision was overturned and Dravid was allowed to continue with his marathon effort. 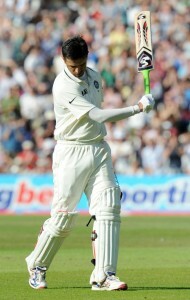 Rahul Dravid, at the close of play, said that he had feathered an edge and so he was rightly given out. Kudos to him for all the after-the-heat-of-battle honesty. Personally, I do not have issues with batsmen standing their ground even if they know they nicked. I consider it professionalism. The batsman’s job is to bat and the umpire’s job is to adjudicate. You live with what the umpires decide, or in this instance, go for the review system if you have any challenges left. However, to the situation in question, it doesn’t really matter one bit what Rahul Dravid thought. Once he decided to stand his ground, the decision is in the hands of Rod Tucker, who ruled him not out. Once England decided to review it, it becomes Steve Davis’s job to find overwhelming evidence to overturn the on-field call. The subjectivity of umpire Davis has no role to play. His responsibility as the third umpire, once a particular decision has been made by the on-field umpires and has been challenged, is to survey all the evidence that is provided to him within the confines of the decision review system agreed between the two sides, to conclusively determine whether a wrong decision has been made on the field. If so, correct it. Let us take the case of Suresh Raina’s stumping on Day 3 of the Oval test. It wasn’t the case of an on-field decision being reviewed. The on-field umpire did not know whether the batsman (Raina) was out of his ground when the bails were taken off by Matt Prior. Based on the video evidence provided to him, Steve Davis ruled the batsman out. I can live with that decision., even though, it was a borderline decision and the general opinion may have been that the benefit of the doubt should have been given to the batsman. In this instance, umpire Davis used his subjectivity to adjudicate. He wasn’t overturning an on-field decision. This is the part of the DRS that really gnaws at me. There is no consistency in its implementation. The system was first introduced as a broadcast tool and has found its way in to a space where it is now part of the decision making process. As Karthikeya Date says here and I here, what is the role of technology and the DRS? Is it to replace the umpires wholesale, or is it there to avoid the “howlers”? That is the fundamental question that needs to be addressed by the keepers of the game (No, Not ECB or CA, as much as they presume it is their divine right but the ICC.). In my point of view, the DRS needs to be used as a tool to review and confirm whether a reasonable decision has been made by the on-field umpires. That is to say, if a reasonable decision has been handed by the on-field umpire, overwhelming evidence needs to be present to overturn that decision, such as an “obvious” inside edge as indicated on one or more of the technological review tools allowed within the DRS. In the absence of that, the third umpire should let the decision made by the on-field umpire stand. As simple as that. This entry was posted in Controversy and tagged DRS, Eoin Morgan, Graeme Swann, HotSpot, India v England 2011, Oval, Rahul Dravid, Steve Davies, UDRS. Bookmark the permalink. Thanks for visiting the site. Cheers. Subash, I’m not sure how many times I’m going to have to point this out to various people but: Davis made no decision. Tucker made the decision based on advice from Davis. Tucker’s decision to overturn is based on both the evidence he asks for from Davis, and his own beliefs. And therefore, any modification to his original decision depends on the strength of his belief in his original decision. If Tucker has already given the benefit of the doubt but suspects there was an edge, and Davis can see a deflection, then he is able to modify his decision given the new evidence, even if you (or I) find it less than compelling. The DRS is NOT a new decision by the third umpire, and presenting it as if it is completely distorts the assessment of what happens. You cannot make judgements on the outcome of a review without knowledge of the strength of the umpire’s belief in the original call. Rightly or wrongly (perhaps wrongly, perhaps not) Tucker is within his remit if he felt whatever evidence Davis provided was sufficient to over-turn his original decision. The fact that there could be any strength to the belief based on what was available as evidence is what intrigues me. From what was shown to us on TV and later on by snicko, there wasn’t any evidence that could have swung the decision the other way. Getting the pedantry out of the way, rather than being distinct from DRS and the DRS starting with broadcasters, the replays called for by umpires are part DRS, and it is the individual tools that started with broadcasters, not the DRS itself. Actually, that’s not completely pointless penantry, since the point is that DRS is a DR System, and we have to think about how it works – it’s not simply a third umpire making an objective decision on HotSpot and audio. For one, it does include his viewing of all the replays from normal spectrum cameras. Secondly, it still includes the subjectivity of the original umpire. In fact, it’s the on-field umpire’s call when it comes down to it. The third umpire’s job is to answer questions and point out any other relevant observations – no more, no less. I do understand that the third umpire relays on the information he “sees” to the umpire on the field. But I am not sure there was anything significant that could have prompted a overturn of the decision. Another problem with your analysis is that you assume what you see is exactly what Davis sees. It isn’t, of course. He has isolated sound in his headphones; he has an HD screen. Who knows how it’s set up in the 3rd umpires room, but your presumption that just because TV shows us a few replays we all, democratically, share the 3rd umpire’s precise experience is flawed. Davis may well have been able to detect compelling evidence for dismissing Dravid that simply wasn’t visible/audible to us at home. Sky did not produce the snicko results right away as they said there was too much background noise, and eventually when they did, there was a signal when the ball was well past the edge. There was no clear evidence in terms of HotSpot. My issue is that we need uniform application of the DRS and when there is no indubitable evidence to the contrary, let the on-field decision stand.